Local news sources distinguish Dr. Neil J. Zemmel as one of the top-rated plastic surgeons in the Richmond area. Richmond, VA — Committed to offering exceptional patient care, Richmond physician Neil J. Zemmel, MD, FAC is honored to have been named a best plastic surgeon by multiple publications in the community. Dr. Zemmel is known for his advanced surgical expertise, compassionate bedside manner, and genuine concern for his patients’ wellbeing. He offers comprehensive cosmetic and reconstructive procedures at Richmond Aesthetic Surgery, where he believes every patient should be treated like family. This philosophy has led to high satisfaction rates and being awarded the top honors in local media outlets. Most recently, Dr. Zemmel was distinguished by three local publications. In its 2018 “Best of Richmond” issue, local news source Style Weekly revealed that Dr. Zemmel was voted Richmond’s “Best Cosmetic Surgeon” by the community. The annual online poll gives readers the opportunity to vote for their favorites in multiple categories, and Dr. Zemmel was awarded first place in the cosmetic surgery section of the Goods and Services category. Richmond Magazine named Dr. Zemmel a “Top Doc” this year in both the Cosmetic Plastic Surgeon and Reconstructive Surgeon categories. To be considered for the publication’s “Top Doc” issue, physicians are nominated and voted on by their peers. Dr. Zemmel earned more votes than any other physician in the Cosmetic Plastic Surgeon category, which he also received the award for in 2014. 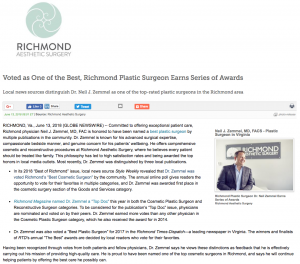 Dr. Zemmel was also voted a “Best Plastic Surgeon” for 2017 in the Richmond Times-Dispatch—a leading newspaper in Virginia. The winners and finalists of RTD’s annual “The Best” awards are decided by local readers who vote for their favorites. Having been recognized through votes from both patients and fellow physicians, Dr. Zemmel says he views these distinctions as feedback that he is effectively carrying out his mission of providing high-quality care. He is proud to have been named one of the top cosmetic surgeons in Richmond, and says he will continue helping patients by offering the best care he possibly can. Dr. Zemmel received his medical degree from the University of Virginia School of Medicine. He then trained in a competitive six-year program at Virginia Commonwealth University Medical Center, completing a combined general and plastic surgery residency. After the completion of his surgical training, Dr. Zemmel spent three years practicing plastic surgery in Florida before returning to Virginia to found his private practice. At Richmond Aesthetic Surgery, Dr. Zemmel performs a wide range of surgical and non-surgical solutions—from breast augmentation and the comprehensive mommy makeover, to minimally invasive options like CoolSculpting® and BOTOX® Cosmetic. In addition to helping patients at his practice, Dr. Zemmel maintains an active role in professional associations, such as being a Diplomate of the American Board of Plastic Surgery, a Fellow of the American College of Surgeons, and a member of the American Society of Plastic Surgery and American Society for Aesthetic Plastic Surgery. He is available for interview upon request. For more information about Richmond Aesthetic Surgery, visit richmondplasticsurgery.com.